Since 2008, Area 10 Faith Community has sought to live out our simply-stated mission to “Love Beyond Reason.” Together, we’ve learned and grown immeasurably in our efforts to translate this mission into action both in our own lives and in the city of Richmond. As I look back over the past eight years, there is no doubt in my mind: God has been blessing us in that mission. Being in the heart of Carytown and sharing a connection with The Byrd Theatre has given us a visible platform as we’ve spread the good news of Jesus Christ. Our location physically communicates that we seek to be a church that is in the city, for the city. The challenge is that we’re short on space. Your families are expanding and more continue to join us for the first time. These are good problems to have! We’re pushing capacity in our A10 Kids classrooms, and we have limited options for events that require a room for more than about 20 people. For some time, we have been looking at buying property near The Byrd Theatre that would allow us to put down long-term roots. The opportunity to take some huge “next steps” is here. It feels nothing less than providential that the doors have been opened for us to purchase not just one, but possibly two (!) properties near The Byrd. The space we will gain through the purchase of these properties will allow us to do more to meet the needs of our current A10 family while increasing our ability to reach more broadly and deeply into our city. These opportunities come at a cost. We are trying to raise as much as possible so we will be ready to move on whatever door God opens for us. Let me be clear, this IS NOT about money or numbers. At its core, this IS a people campaign. At A10 we ARE about reaching hurting people in a broken world with the good news that freedom, hope and purpose can be found through relationship with Christ and his followers. Now, more than ever, our neighbors, city, and world need to hear this message. I believe that God’s dreams for A10 are beyond anything we can ask or imagine (Ephesians 3:20). So, we are confidently moving forward in response to all that God has already done. I’m excited to see how God uses the physical expansion of our church to develop us individually, as a family, and for our community. I look forward to the day (one, five, or ten years from now) when we look back in awe at what God does next. Click on the image to download the BEYOND Brochure or Conversation Guide. Look at some of the possible dreams we have for the space next to Cartwheels & Coffee. Keep in mind this is just an example of what could be done and that the actual plans will depend on the budget created based on the money raised and committed. Your prayers and support throughout this campaign are requested. 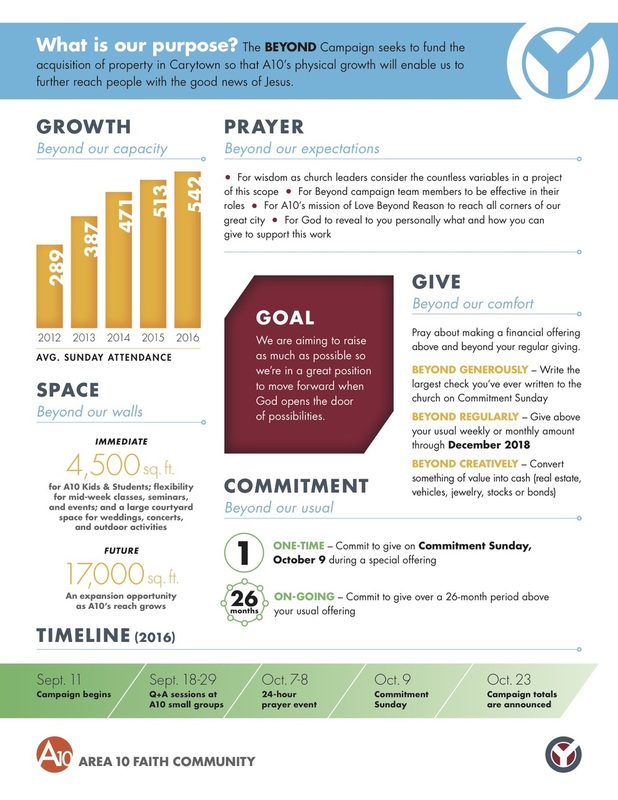 A Prayer Guide has been created as a way to help you think through some of the issues, values, challenges, and ideas that make Area 10 the place that it is, and to help you see how the Lord might be calling you to grow with us. Specific prayer requests can be made for the campaign and you can also participate in weekly prayer walks. A special 24-hour prayer event (October 7-8) is planned as well (more information to come). Click the links below to access the guide, reminder card, and prayer request form. We'll be spending 24 hours in continuous prayer as a church family on October 7 & 8 from 6:00 PM Friday evening through 6:00 PM Saturday evening. Join us for one or more 30 minute segments at Cartwheels & Coffee. Families are welcome and children are encouraged to participate. Come participate in an interactive prayer experience with your A10 family. Stations will be set up throughout Cartwheels to guide you in praying for our church, our city, and the Beyond campaign. In addition to prayer stations, we will have a quiet room for those (adults) who would like to pray in solitude and without distraction. We recommend signing up for an hour in order to have sufficient time to go through the various stations, but you may prefer to spend more or less time. You may sign up for as many successive half-hour segments as you like, as they are available (We will limit the number of people per half-hour to 10). We encourage parents to bring their children to participate, and for friends to sign up and attend together. We want this to be an opportunity for us to connect with God and each other as we pray together for our church, our city, and our world. We are committing to 24 hours of continuous prayer, and will ask that some of you sign up to be praying during the overnight hours. We'll provide online resources to guide your prayer time at home. If you're at all able to join us at Cartwheels & Coffee, we want to encourage you to do so, but if you aren’t, we still want to invite you to join us in prayer. We'll post an online prayer guide for those of you who will be joining us from a distance.